Order your Yamaha PKBB1 X Keyboard Bench from AMS and enjoy Fast & Free Shipping. Get the Best Deal with our Lowest Price Guarantee & Great Customer Service! The Yamaha PKBB1 Keyboard Bench offers lasting comfort and a reputation as one of Yamaha's top-selling benches. Its ultra-thick padding and extra-wide single seat assures the utmost comfort for hours of music enjoyment. With a definitive black finish and a soft padded seat, this bench is fully adjustable for individual comfort and folds up for your traveling convenience. What can I say. It’s beautiful, it does it function extremely well, it’s comfortable and the price is perfect. This was easily one of my best investments! 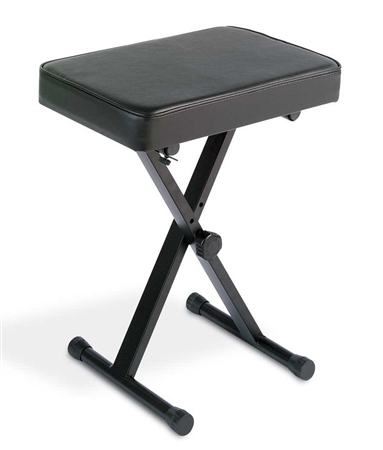 I no longer have to worry if there will be seating for me at a gig because this adjustable bench allows me to sit comfortably at my keyboard in any venue and play my best. Timely delivery and exactly what I ordered. Super comfortable and so affordable! This is very well cushioned for long lasting comfort! Definitely worth your money! Solid construction, ease of operation. Excellent quality.